Spending on search marketing, online video, social media and other unmeasured formats grew faster in 2011 than measured media such as TV and magazines. Ford's prelaunch marketing strategy for the redesigned 2013 Fusion, announced last week, is a sign of the times: The cutting-edge combination of social media and entertainment is the kind of nontraditional advertising that is breaking out all over in the auto business. Across the board, automakers are shifting advertising dollars from traditional media to an array of new methods that include search marketing, online video and social media. Last year Ford became the first major automaker to spend more on so-called unmeasured, new-media forms of advertising than on traditional ad purchases -- TV, radio, magazines, newspapers, billboards and Internet display ads, according to Advertising Age's annual 100 Leading National Advertisers report. Ford is adjusting to the "absolute reality of the times," said Matt VanDyke, U.S. marketing director. And so is the industry as a whole. Although the economy picked up in 2011 and new-vehicle sales rebounded, traditional advertising declined at Ford, General Motors and Toyota Motor Corp., three of the four largest auto advertisers in the United States. GM, the No. 1 auto advertiser, went from $2.15 billion in traditional media categories in 2010 to just $1.77 billion last year, according to Kantar Media figures reported by Advertising Age, which, like Automotive News, is owned by Crain Communications Inc. Spending fell across the board among GM brands, with Cadillac down 16 percent, Buick off 15 percent and Chevrolet down 7 percent. Yet GM's overall U.S. ad and promotion spending increased 11 percent to $3.06 billion because of a 115 percent increase in nontraditional spending, to $1.28 billon, according to Advertising Age estimates. "Year-to-year, we've been increasing the percentage of our advertising spend that we've dedicated to online and digital," said Patrick Morrissey, GM's director of product and brand communications. "It is a key trend that is happening in all industries, but especially in the auto industry." Ad spending at Ford and Toyota also went up last year, but only because of growth in nontraditional areas. Ford's ad buys on measured media dipped slightly to $1.1 billion, but its estimated total spending rose 12 percent to $2.14 billion. Ford has enlisted celebrities such as “American Idol” host Ryan Seacrest for its Random Acts of Fusion campaign touting the 2013 Fusion. Last week Ford announced it will push use of social media further when it kicks off its Random Acts of Fusion campaign for the 2013 Fusion, which arrives at dealerships this fall. 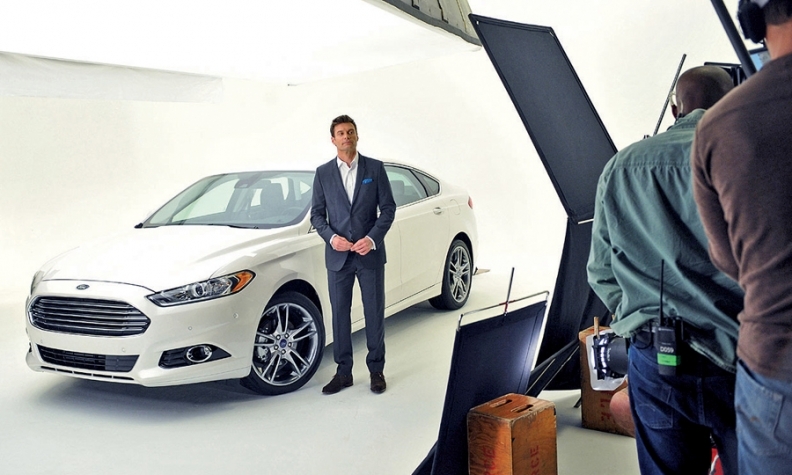 Ford has enlisted celebrities, including "American Idol" host Ryan Seacrest, in a cross-media storytelling campaign. Seacrest will lead participants through an interactive tale that traverses social media, radio and TV and gives them a chance to use a Fusion for experiences of their choice. The traditional marketing launch will come this fall. "Consumers will have to work together to unlock the story and, as the program evolves, have a chance to see for themselves how Fusion is able to transform the lives of the people who drive it," said Crystal Worthem, a Ford marketing manager. Jim Farley, head of global marketing, sales and service at Ford, said that "combining social media, entertainment and unexpected consumer experiences will allow us to connect with audiences through every type of media." The game-playing began last week on the Ford Fusion Facebook page. Multimedia production company 42 Entertainment and Team Detroit, Ford's advertising agency, are developing the program. It runs through October. Last year the top 10 U.S. auto advertisers increased spending on search marketing, online video, social media and other unmeasured formats much faster than on traditional measured media such as TV and magazines. GM's Morrissey said 25 to 30 percent of the company's advertising spending is now in social and digital areas. The marketing effort for the 2012 Chevrolet Sonic went the digital route, avoiding TV advertising for the first six months after its launch. GM relied on a series of online videos posted on letsdothis.com that featured the car in a series of stunts, including bungee jumping and sky diving. Indeed, all carmakers are putting more into nontraditional advertising, which also includes direct marketing, promotion, co-op advertising, coupons, catalogs, product placement and events. Advertising Age, which estimates unmeasured ad and promotional spending, says paid search, video, digital-related customer relationship management, direct marketing, mobile marketing and unmeasured forms of social media largely drove the increase in the category. But certain types of unmeasured spending that is largely nondigital also grew strongly, the publication says. Event marketing is an example. Advertising Age estimates that 2011 U.S. revenue of event-marketing powerhouses George P. Johnson and Jack Morton Worldwide each rose about 15 percent, driven in large part by automotive clients. George P. Johnson's clients include Chrysler Group, Honda Motor Co., Nissan Motor Co., Toyota and Volkswagen. Jack Morton is GM's agency of record for so-called brand experiences. While traditional media advertising slowed for the largest automakers in 2011, other companies upped the ante in both traditional and nontraditional arenas. After emerging from bankruptcy, Chrysler, the No. 3 auto advertiser, according to Advertising Age, poured $1.3 billion into traditional advertising in the United States in 2011 and $484.5 million in nontraditional avenues. In 2010 the company spent $869.4 million on traditional media and $294.5 million in nontraditional areas. Kia, whose commercials have become a staple during NBA programming, increased total ad spending by 45 percent in 2011. The South Korean company spent $497.8 million in 2011, with traditional ads accounting for $375.7 million and nontraditional spending amounting for $122 million, according to Advertising Age estimates. Volkswagen increased U.S. ad spending by 70 percent last year, investing $510.7 million in traditional media and $218.9 million in nontraditional outlets.